As of the beginning of 2010 a number of amendments have been introduced to the Value Added Tax system which are mainly related to the amendments of Directive 2006/112/EC on the common system of VAT as regards the place of supply of services and regarding the VAT refund to persons established in other EU Member States. The most important changes in the VAT legislation are summarized below. 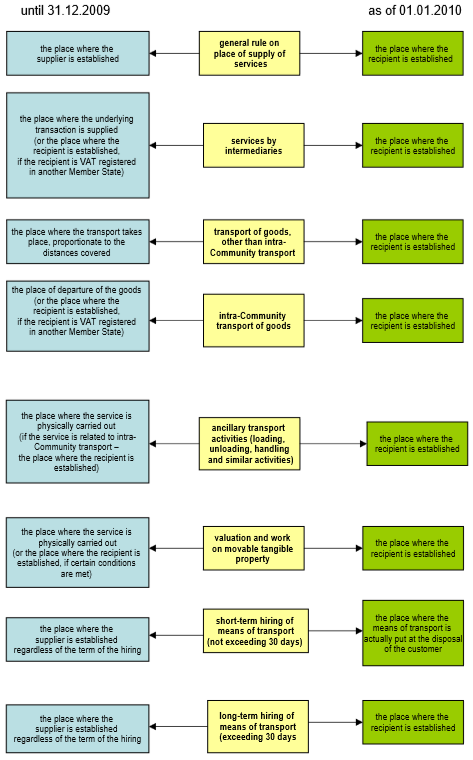 Where services are supplied to taxable persons, the place of supply would be based on the place where the recipient is established. It has been also specified that if the service is provided to a permanent object in a place other than the place where the recipient is established, the place of supply would be the place where that permanent object is situated. Where services are supplied to non-taxable persons, the former general rule applies and the place of supply is the place where the supplier is established. The exceptions to this general rule are expressly set forth and encompass mainly the so called intellectual services when provided to non-taxable persons established outside the EU who used to fall under the specific provisions of Art. 21, para. 3 in its wording until 31.12.2009 (e.g. transfers of copyrights, advertising services, services of consultants, lawyers and accountants, supply of staff, etc.) In those cases the place of supply would be the place where the recipient is established. cultural, artistic, sporting, scientific, educational, entertainment and similar services – the place where the service is physically carried out. In relation to the changes in the place of supply of services rules, there are also amendments to the provisions on the persons liable to payment of VAT. The VAT shall be generally payable by the recipient of the service where the supplier is not established in Bulgaria and the service is supplied in Bulgaria and is taxable. As a result, the reverse-charge mechanism becomes the main mechanism for accounting for the due VAT. As of 1 January 2010 the time limits for enjoying the right to deduct the input VAT is lengthened from three to twelve months. The longer period is also applicable for right to VAT deduction which occurred up to 1 January 2010 but has not been enjoyed up to that date and with regards to which the three tax periods following the period during which the right occurred have not lapsed.